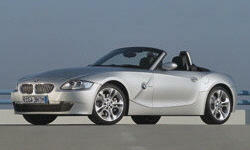 Why the 2006 BMW Z4? The 2006 Z4 is the classic styling that has always gotten a person's attention. Squared rear, rounded front with the classic 2-part grill. The convertible top is a light brown in color which makes it standout from the other black top models seen. 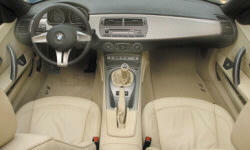 Though the Z4 has a lot of features, the dashboard is simplistic to look at, easy to use. I find the front seat, even heated, to have great lumbar support, my sciatica does not bother me even when I have to use the clutch. Those with long legs are amazed at all the leg room available. Around town I get about 23 mpg but on the open highway, get 30 to 32 mpg which is huge since the Z only uses premium grade gas. due to the tires (high performance) width, the ride can be a bit jerky if the road are warped but on a smooth highway the drive/ride is unbelievable. The Z typically comes with 'run-stop' tires which were really a very hard ride so that is why I changed to traditional tires. The only problem will be if I ever get a flat, there is NO spare tire. Why Not the 2006 BMW Z4? The trunk is quite large for several bags which is pleasantly surprising. Went home and did some Consumer Reports comparison of the cars and the 2006 Z4 3.0i was a best buy for that year. the price Consumer Reports suggested was more than the dealer wanted and the mileage was low (12,800) so we decided on this one. Love 6 speed but husband had to 'relearn' manual.